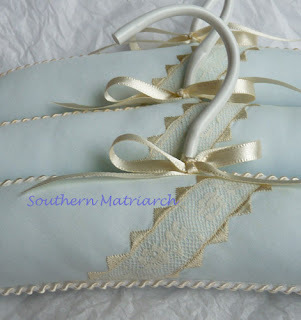 Southern Matriarch: Everyone has hang ups and a giveaway! Everyone has hang ups and a giveaway! Some hangups are just prettier than others. This hanger makes me cringe. I have spoken to my distaste of wire hangers before. Nothing makes me cringe more than to see a garment that someone has worked so hard on and is so proud of hanging limply on a wire hanger. Aggh!! I hate it. If you go back through all of the posts you will see garments hung mostly on satin padded hangers. A couple on some vintage nursery hangers. Mostly on the padded hangers. So in light of a nursery that is going to be filled with garments lovingly made, I made a few hangers. Some to match a garment and some because I was on a roll. 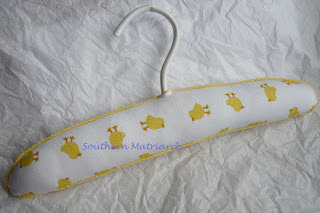 This sweet hanger was made to match a daygown that is not quite finished yet. It is a duck print pique trimmed with yellow gingham piping. These are made from Imperial batiste, trimmed with scraps of lace, some machine embroidery and piped with whip stitch piping. To top it off, a little ecru bow. I love blue and ecru together. I am not as big a fan of pink and ecru. And I adore white and ecru. Maybe I will make some white and ecru hangers as well. This is a close up to see the simple embellishment on the front. This lace was literally a scrap in the bottom of the box of laces. It was not longer than 4" long. I used Sulky rayon thread to do the diamonds on either side which is a decorative stitch on my machine. #1 Leave a comment and tell me what you are working on. #2 If you are a follower AND leave a comment, you will be entered twice. #3 If you have a blog, post a link in your comment where you mention the give away on your blog. This will also get you an additional entry. Please, no email comments. Only comments left here will be eligible. When I announce the winner, they will need to email me their mailing address. This give away will be open until January 28th at midnight. Good luck everyone! And help stamp out wire hangers. Well, those are such cute hangers! I have several of the same white, padded hangers that I need to cover with pretty lace & stuff. Perhaps I'll make a few today. Those are aboslutely beautiful hangers. I would love to have instructions to make some too. I have only been sewing about two years and still learning. I have three grandchilren and a niece I sew for. I am currently working on an Easter dress for my niece. It was on the cover of Creative Needle. It is a mint green smocked dress with a coat. I am going to attempt to make the coat. I absolutely love your blog and read it everyday. Just to let you know I have used plenty of tutorials. I hope you have wonderful week. You can tell I'm not very computer savvy either. I did not intend for it to be anonymous. I am sitting here smiling, looking at these hangers. I'm so happy for you and JD. You are making so many pretties. 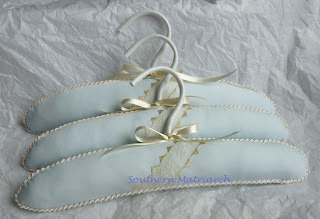 I love the hanger with the lace where you did the decorative diamond stitching. So cute. I also can't wait to see the daygown out of the duck pique. I'm working on my bunny blanket STILL! I love your hangers. We would love to have instructions on how to make them. You asked what we were working on. I am a quilter and I currently have four projects I am working on and trying to finish up. Also I teach quilting to a group of ladies in our small town in Georgia. And I am involved in two other quilting groups in our area. These activities keep me out of trouble!! Martha, those hangers are gorgeous! I have just begun reading your blog and it is inspirational. I would like to learn more about making padded hangers, especially with new grandchildren in our future. Martha, I forgot to tell you what I am working on. I am doing two ensembles for twin grandbabies who will arrive, God willing, in May. One pink, one blue. I'm using CC Bunny Knit Nightie and learning to do machine embroidery on Sea Island Knit. This DIL doesn't iron and even if she did, she might change her mind with twins. Those little hangers are adorable!! I am already a follower and have you on my blog roll. I love your gorgeous blog! These are gorgeous! Would love to see a tutorial on making them. I am working on picking a paint color for the sewing room and unpacking! I love the hangers. You and kathy have me so inspired. I am always on the look for them but they are so hard to find anymore. Never thought about making my own!!!! I am working on spring clothes for my dgd's first birthday, which is Valentine's Day!!! The next item up is a spring jacket and bonnet to match. Hi, I'm working on three newborn baby bishops (2 boys/1 girl). Today I finished smocking the girl's gown in pink and ecru! I do agree, blue and ecru are so much prettier. One of the boy's gowns is in blue batiste with a cute teddy bear ecru lace edging. The other will be in white batiste with white teddy bear lace edging. The hangers are great, please post a tutorial! well, first, I am so stinking happy for you and JD, I could burst! Second, I have two ladybugs to do on my blanket...and, I started smocking Dottie's Day Dress.....with a design from AS&E. I am working on 2 OFB Rose Raglan sleeve dresses. Love your hangars!! I would be proud to be the owner of any of them. I'm working on a hand embroidered table runner. for me!! Those are beautiful! I am currently working on a crochet edged baby blanket, my girls' Easter dresses, Easter egg hunting outfits and more blankets. Whew, I need to get busy! I'm ashamed to admit that I'm working on a Halloween table runner that didn't get finished last Halloween. My daughter told me to not let it go to the unfinished pile! Darling hangers Martha. I am joining that "new grandma" club in September. I would love some wonderful hangers for those special outfits. Just finishing up two sets of pot holders and gloves for DD and for me (I'm tired of burned fingers! ), from fabric from BessieMary's stash. Next on the to-do list: pjs for Griffin from leftover fabric from his cousin Damon of a few years ago, and birthday shorts for Damon (yes, shorts -- he lives in the south!). I love your hangers. I hate wire hangers, too. I don't use them at all. I do use plastic ones that aren't embellished in any way most of the time. But, after seeing this post I will have to start using prettier ones. I would love to win your hangers. I am a follower, as you know, and I will post a link on my blog. I'm working on pleating (again) 2 24 rows for Titania. Yes, I am a follower and agree totally on your wire hanger fedish. I need to learn how to make padded ones, I usually buy them. I don't have a blog but I do have a website. I will post this link on there if that's ok with you? Does that work! Now I'm waiting on you to do a tutorial on making hangers. I actually came to your blog to see if you have given any hints for pleating 24 rows. Cute hangers! I'm working on two bishops and two quilted table runners and then I have two additional little dresses waiting in wings to work on and then there is that cabinet of stashed material....I have enough to work an entire year at the rate I'm going! HA! Love your beautiful hangers. I submitted a quilted jacket one year to the State Fair. When I went to the Fair to see it displayed, it was hanging on an ugly old wire hanger :-( Thanks for such a sweet giveaway ! Hi,Martha! Love your hangups! That ducky one is so sweet and you are right. Clothing on wire hangers is doing no service to anyone. I am a follower. Please enter me in the giveaway. Forgot to tell you what I am working on! It is a bag that I am donating for a raffle where I work. So far it's looking pretty good. Check out the blog for more. I am almost done. WOW! What a blog! I love it ALL...And THANKS SO MUCH for sharing your talent with us! I'm working on Wee care gowns before a nursing congerence this Friday...Get to earn CEU's and talk about SAGA! Hugs, Karen in La. I follow your blog and enjoy all your creations; the cute hangers are no exception. Love them and I totally agree with your distaste for wire hangers! Now let me get busy and finish that smocked bishop, but first I need to finish the little apron I'm making for my 3 year old GD. She loves to help cook and needs her own apron! 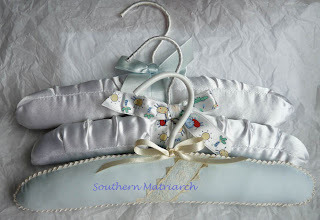 Beautiful hangers for beautiful clothes, I am working in a bubble from Old Fashioned Baby for my baby girl, it is my first baby,it is my first garment,so I am going really slow! Truth to tell, I have mostly been in a mending morass, but with high hopes of emptying out my closet full of mending projects . . . some time. With so many little ones to sew for, it's hard to decide where to start. Maybe I'll get something going for Easter. Would love those little hangers. Right now, I'm working on some preemie gowns for the GNO SAGA guild. Hopefully what I make helps to ease the pain for a new mom and dad. I read your blog every day and enjoy all your tips and comments. Okay, I hate wire hangers as well. Do not have them in my home at all. My closet has only wooden hangers unfortunately right now there is no rod to put the hangers on... but you get the picture. I am currently working on a handsewn wool crazy quilt. It is a BOM project I am doing with Barri. 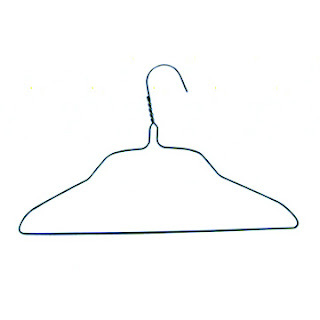 It does not need a hanger, there is no one in my immediate future who needs a hanger that size, but I have to enter. Mainly as I can hear your rant over the wire hangers. Love you! Those are beautiful hangers. I've been looking at your things on flickr. Amazing. I'm working on some pj's for my grands, but I'm about to do a special outfit for my granddaughter. Just lovely! Something to have a cherish forever. Our family has a Heirloom gown passed from one generation to the next. I would have to donate one to them! Gosh if we must be honest I have not sewn since Christmas. I must get started on some gifts for my little grands! Oooh I love them! I am working on daygowns for my first baby. 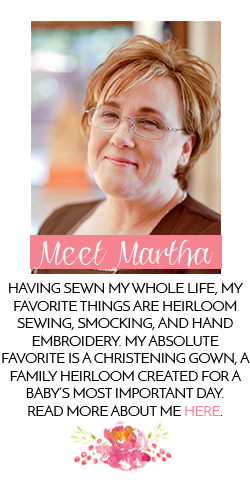 I would love something made by Martha! I am starting on your favorite project . . . a christening gown! In early March my brother and sister in law are expecting a little girl. I plan on making Cherry Williams smocked christening gown and bonnet. Thank you for all that you do! It's a pleasure to read your blog . . . something I look forward to reading daily! Sweet pink and 200 posts!